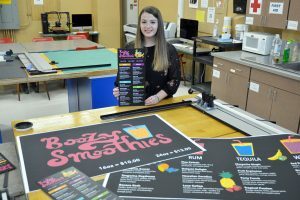 SUNY Oswego graphic design major Julie Farquhar of Lowville prepares for the spring BFA Exhibition, showing a few of her portfolio items for a fictitious business, Boozy Smoothies, concocted with her friends. Farquhar is one of a dozen candidates for the bachelor of fine arts degree showing her work in BFA Exhibition I, April 23 to 30 in Tyler Art Gallery. 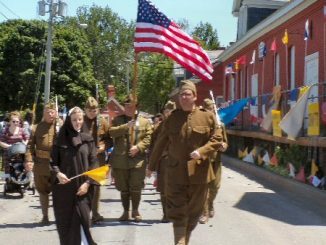 BFA Exhibition II, with the work of 11 more artists, runs May 7 to 15. OSWEGO — The portfolio work of 23 SUNY Oswego bachelor of fine arts degree candidates will greet visitors to Tyler Art Gallery for two spring BFA exhibitions. BFA Exhibition I will run April 23 to 30. A free public reception for the 12 student artists will take place from 5 to 7 p.m. Friday, April 26, in the gallery and Tyler Hall’s lobby. 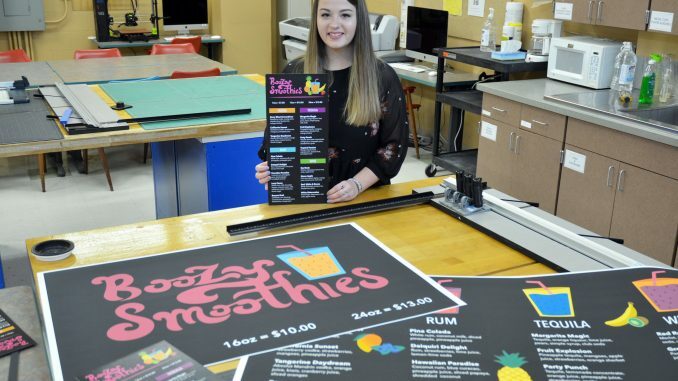 A graphic design major, Farquhar has worked on a brand identity project called “Boozy Smoothies.” She has produced a sign with a carefully hand-drawn font for the fictitious business name, a large menu board, several menus, T-shirts, a cap, stickers and a cup.